I’ve been experimenting with different skin care products trying to find ones that will not cause breakouts. One thing I have learned is that my skin is extremely sensitive to chemicals and my skin clears up when I use products with natural ingredients. 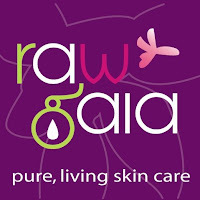 Raw Gaia products are PERFECT for my skin. They make the world’s first range of living skin care products made from cold-pressed, organic and vegan ingredients infused with essential oils and floral waters. Because of the pure ingredients, they moisturize, nourish and uplift your complexion giving you that healthy glow. Not only do they make outstanding chemical free products, they also are an ethical company. They certify that their ingredients are organic, vegan and cruelty free and as much as possible are fair trade and chemical free. They offer a wide range of products that your skin will love. I bet the Raw Chocolate Face Pack would work wonders. From moisturizers, creams, toners, massage oils to soaps, bath melts, and Tibetan jewelry, they have something for everyone. I tried out the Rhassoul Clay Face Pack for my review. Rhassoul Clay is sourced from Morocco and has been used for hundreds of years as a natural beautifier. It’s a light brown clay that is known for exfoliating, cleansing and detoxifying your skin. It will draw out any excess impurities deep within your skin. It can be used daily because of it has anti-inflammatory, analgesic, anti-microbial and antiseptic properties. It will help people with acne, psoriasis, and eczema. I used this as a mask and found it fairly straight forward to use. It comes in a powder format. You take 1 tsp and add warm water to make a thick paste. Then you wipe off after 10 minutes. It does dry quickly so you do need to keep adding water to keep your face damp. The only thing I can say here is that there is an extra step in adding the water which may not be as convenient for some. However, the product is completely natural so if it was ready to use, you would probably have extra chemicals in there. So in this case, I don’t mind doing the extra step. I found this product made a BIG difference in my complexion. I always had breakouts despite being 31 years old. I was shocked that my acne has almost cleared up. It’s not completely gone yet, but its much improved! I just have the scarring to deal with, but at least I don’t have the embarrassing breakouts. This is one fantastic product and an awesome company! Their prices are in pounds, but can be converted to USD. 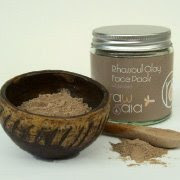 The Rhassoul Clay Face Pack is $11.03 and shipping is about $5 making this product affordable. 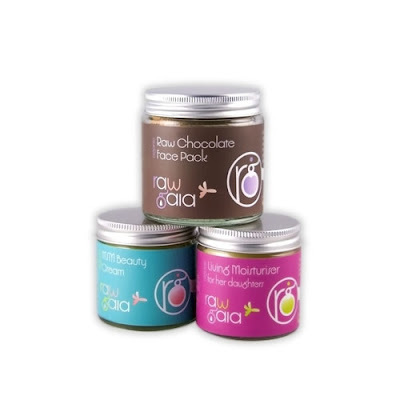 To purchase a product from Raw Gaia, please visit their site.